All club races will be governed by the I.S.A.F. Racing Rules of Sailing (RRS), the prescriptions of the R.Y.A. and the rules of each class, except as any of these are changed by these sailing instructions. An additional restriction for Seabird Half Raters of a maximum of four crew shall also apply. Eligible boats will be deemed to enter a club race by being in the vicinity of the start line during the starting sequence. If the boat has one or two owners then one owner must be a member of Wallasey Yacht Club. If the boat has more than two owners then two owners must be members of Wallasey Yacht Club. A valid and current certificate of insurance including third party liability cover to £3,000,000 and adequate racing risk cover must be held for the boat. All boats entering club races must have a valid and current class certificate or rating certificate. Any alterations to the boat and/or gear must be notified to the Race Officer/Race Committee. The Race Committee reserves the right to allocate provisional handicaps or amend existing ones. At least half of the crew in a competing boat must be club members and the boat must be steered throughout the race by a club member. The helms-person should “sign-off” on the race results sheet at the end of the race to signify that they have completed the race in accordance with the RRS, class regulations and these Sailing Instructions. On open and half deck boats each person shall wear an efficient life-jacket or buoyancy aid. The safety of a boat and her entire management including insurance shall be the sole responsibility of the owner/person in charge who must ensure that the boat and crew are adequate to face the conditions that may arise in the course of the race. Neither these sailing instructions nor any inspection of the boat limits or reduces the absolute responsibility of the owner/person in charge for the crew, the boat and her management. The race organisers shall not be responsible for any loss, damage, death or personal injury howsoever caused to the owner/person in charge or crew, as a result of their taking part in the race or races. Moreover, every owner/person in charge warrants the suitability of the boat for the race or races. Notices to competitors will be posted on the official notice boards in the foyer of Wallasey Yacht Club. Any changes to the sailing instructions will be posted before 2000 hours seven days prior to the day it will take effect. Any change to the schedule of races will posted by 2000 hours seven days prior to the day it will take effect, this includes any re-arranged dates for postponed races. Signals made ashore will be displayed on the Wallasey Yacht Club starting platform. Handicap Yachts Wear personal buoyancy. Seabird Half Raters No spinnakers are to be flown. Handicap Dinghies No spinnakers are to be flown. For the schedule of races please see the current Wallasey Yacht Club fixture list in the club yearbook. The official club courses can be found in the current Wallasey Yacht Club yearbook. 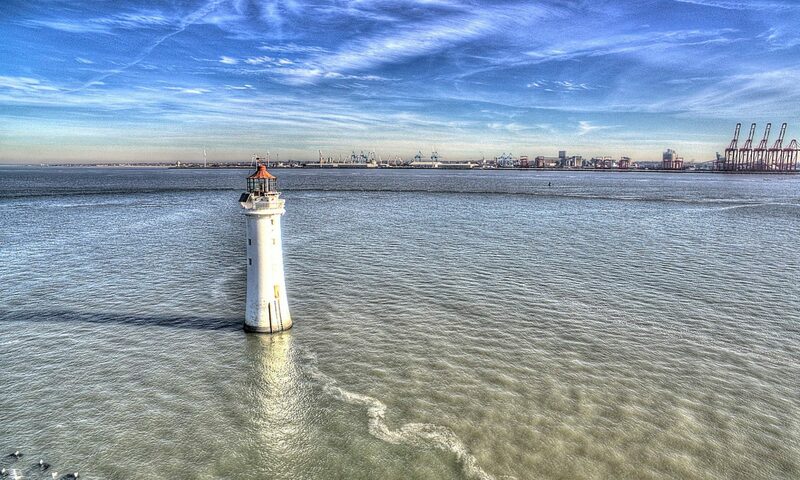 In the cases when limit mark(s) are laid to the east of the Rock Lighthouse and Fort Perch Rock they shall be passed on their channel side at all times and are to be considered as marks of the course. This instruction is to apply to all of the club courses. Code flag ‘R’ displayed over the course code flag and/or course board ‘R’ displayed after the course number board will signify that the course is to be sailed in the reverse direction. Shortened course will be signalled by the two sound signals and the hoisting of an orange and orange spherical shape on the flagstaff, this means all classes have been shortened. Code Flag ‘S’ flown below the race code flag of the race to be shortened means that that class has been shortened. All boats in a race that has been shortened shall complete the leg of the course the leading boat is on at the time of the shorten course signal and then proceed directly to the finishing line. In the case where the leg on the course that the leading boat is on is such that the next mark on the course is the start/finish mark then the side on which the course states the start mark should be left should be ignored and the boats should proceed directly through the finish line (i.e. pass to the west of the start/finish mark). Shortened course will be signalled by two sound signals and the hoisting of an orange spherical shape and Code Flag ‘S’ flown below the race code flag. If the launch is on station on the finishing line AT THE TIME THE SHORTEN COURSE SIGNAL IS MADE, all boats will continue to sail the next leg of the course before returning to finish the race between the launch and the outer distance mark/start mark. HOWEVER, in some circumstances the launch may decide to finish the race at any mark of the course. In this case all boats will finish between the launch/committee boat and the mark of the course chosen by the launch/commitee boat. Races will be started using rule 26, with classes starting at five minute intervals. The starting line will be a transit line taken from the flagstaff flying the Wallasey Yacht Club burgee on the starting platform and the flagstaff flying an orange diamond mounted on the promenade railing directly in front of the starting platform. The Wallasey Yacht Club start mark moored approximately 50 metres north of the moorings is a limit mark, all boats must pass inshore of this mark when starting. The alternate starting line shall be indicated by the Second Substitute flag being flown from the mast of the Launch/ Committee Boat. The start line shall be between the WYC Burgee on the mast of the Launch/ Committee Boat and whichever buoy or landmark chosen. Boats whose preparatory signal has not been made shall keep clear of the starting area and of all boats whose preparatory signal has been made. When at her starting signal any part of a boat’s hull, crew or equipment is on the course side of the line, a second gun will be fired and the code flag X will be displayed by the start/committee boat, the X flag shall be displayed until all such boats are completely on the pre-start side of the starting line, in accordance with RRS 29.1. 11.2 Finishing Races from the Launch Seabird. When a boat may have broken a rule of part 2 and rule 31 in the same incident she need not take the penalty for breaking rule 31. If the boat caused injury or serious damage or, despite taking the penalty, gained a significant advantage in the race or series by her breach, her penalty shall be to retire. A protesting boat must conform to RRS 61.1 (a). In addition when “signing off” at the end of a race the protestor should ensure that their intention to protest is appended to the results sheet by the Race Officer within two hours of the finishing time of the last boat. The protest must be submitted on forms available from the clubhouse and be accompanied by a sum of £5.00 by 2000 hours on the day after the race in question to a member of the Race Committee or the Sailing Secretary. The £5.00 will be forfeited if the protest is not upheld. The Low Point scoring system will be used in a series of races. The winning boat will receive 1 point, second boat 2 points etc. No sail-overs will be allowed.